Natural Body Lotions are important to keep your skin healthy, moisturized and more youthful looking. The following natural lotions provide everything your skin needs. They provide natural nutrition, moisture and very important protection to keep your skin healthy. There are so many excellent natural lotions out there it was really hard to narrow it down to these five. Each of these natural brands offer more body lotions than the ones you see below. The ones below have received the best reviews and are the most economical, proving that more expensive does not necessarily mean better quality. Trilogy Nourishing Body Lotion This is a light, non-greasy lotion that is deeply moisturizing and nutritious and is suitable for dry, sun damaged, mature and sensitive skin types.Trilogy Nourishing Body Lotion contains nourishing plant oils that provide moisture and protection. Organic Rosehip Seed Oil is nutrient rich making skin soft and moisturized all day long.Trilogy products contain 100% natural ingredients and are 100% vegetarian. They contain no Parabens, Petrochemicals, Pesticides, GMO's, Harsh Surfactants, or Synthetic Dyes And Fragrances. John Masters Blood Orange & Vanilla Body Milk This is a quick absorbing, light weight lotion that is silky smooth and very rich in nutrients.Blood Orange detoxifies and aids in collagen production, Milk Thistle is high in antioxidants, Vegetable Glycerin acts as a humectant keeping skin moisturized all day, Arnica moisturizes and stimulates blood circulation, Aloe Vera soothes and acts as an anti inflammatory and helps heal dry damaged skin and Bourbon Vanilla gives it a yummy light scent.Sold in over 30 countries now, John Masters products are free from Parabens, Petrochemicals and other harmful ingredients. Cattier Moisturizing Body Milk-Nourishing This body milk soothes and deeply nourishes skin and is suitable for all skin types.Geranium Oil is rich in essential fatty acids and has a soothing and calming effect on skin. Shea Butter is rich in moisture and aids in restoring dry or damaged skin. It also provides protection for your skin all day long keeping it soft and supple.Cattier products are certified natural and organic and contain no Parabens, Petrochemicals or synthetic Dyes and Fragrances. 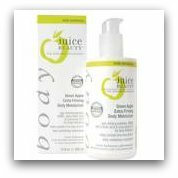 Juice Beauty Green Apple Extra Firming Body Moisturizer This daily moisturizer helps smooth lines and firm skin. This is one of my favorite body lotions.Organic apple, lemon and grape juices provide your skin with nutrient rich essential fatty acids. It also contains age defying alpho lipoic acids, coenzyme Q10 and Vitamin C.Juice Beauty products are made with certified organic ingredients and are 100% vegetarian. They contain no Parabens, Pesticides, Petroleum, Propylene, Butylene Glycol, Sodium Laurel Sulfates, Phthalates and Synthetic Dyes and Fragrances. 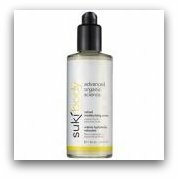 Suki Velvet Moisturizing Cream This is a very luxurious lotion that is suitable for all skin types.It deeply nourishes, heals and provides all day protection for your skin. Organic Cocoa, Coconut Oil and Shea Butter nourish and heal dry or damaged skin and improve skin tone and texture. Organic Botanicals with healing properties smooth away bumps and imperfections for smoother, softer and healthier skin.Suki products are all 100% natural and 90% organic. Try one of these natural body lotions to fight dry skin and enjoy the benefits of healthy, beautiful natural skin!